NBA Rumors – Becky Hammon is Going to be a Head Coach one day? 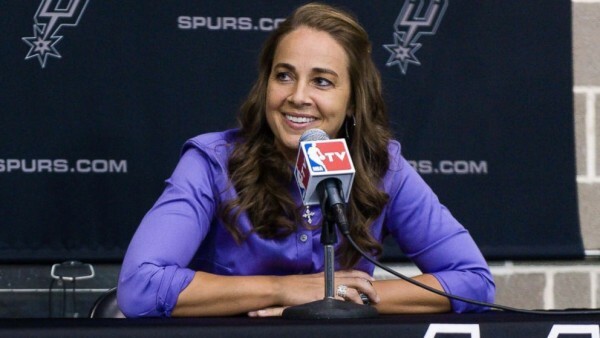 It seems that winning the Summer League title with the San Antonio Spurs and working under Gregg Popovich has gotten everyone convinced that Becky Hammon will find herself being the head coach of a team in the NBA one day. Those who can’t wait for progress and change are already trying to mark the date it’ll happen. In 2017? The beginning of the 2016-2017 season in San Antonio while Popovich steps down? Right now it’s all fantasy, and with all due respect to Hammon, it might a long way and time before she’s promoted from assistant coach to being the head of a coaching staff on an NBA team. Adam Silver: So I’m enormously proud of her, and I’m enormously proud of the players who’ve quickly seen that she’s a top-notch coach and have been willing to follow her. I think just like we’ve seen enormous change in our society, just in the last decade, I think that’s another ceiling, another barrier that will be broken. And it takes women like Becky being out there. You need pioneers, and there’s been other pioneers before her, but I think you couldn’t ask for more of a complete package in terms of former player, student of the game and someone who’s able to work within a strong organization like the Spurs. Charles Barkley: At some point there’s going to be a female coach in the NBA, and more power to them. Becky Hammon had a much better chance at winning with the Spurs than she had with the Sacramento Kings. Eventually, it’s all about the players. Even if Popovich stands down in the near future, right now Ettore Messina is probably higher up the hierarchy than her, and more likely to step in for Popovich if and when he retires.